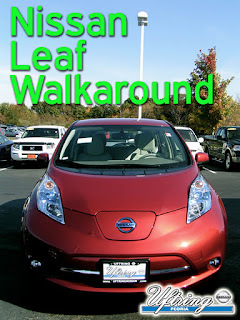 Have you seen the Nissan Leaf in person yet? Until you sit inside the cabin and take a test drive you don't know what you're missing out on. This car is absolutely silent when started, has some serious pep, a mandate to accelerate quickly, and a joyful start up tune reminiscent of a video game console. We highly encourage you to come in and test drive this innovative electric car. It's unlike anything else on the road today. Watch Tim show off the Nissan Leaf, which arrived a few weeks ago at our dealership, Uftring Nissan in Peoria, Illinois. He explains the unique features and amenities of the Nissan Leaf and shows you some of the bells and whistles. It's a great look at the outside and inside of the 2011 World Car of the Year. Stay tuned for more photos, info, and videos of this innovative electric car. Like Uftring Nissan on Facebook, and don't forget to schedule some hands on time with this red beauty.